Not even a day after Pouing’s release, another D2P game hits the shelves of the Windows Phone 7 Marketplace. 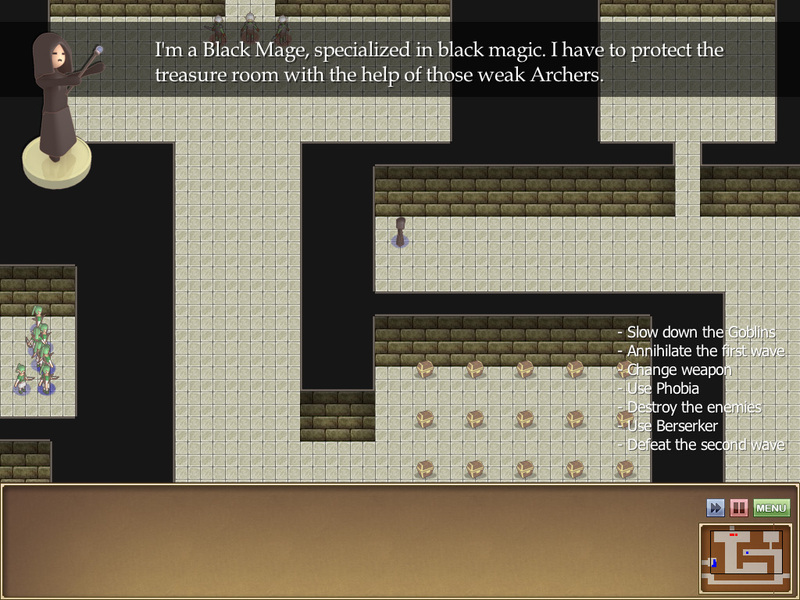 Tower of Ordal is an RPG I’ve been working on for a long time now. It’s a dungeon crawler where you explore a labyrinth, look for treasures and fight monsters. Climb the 16 roofs of the tower and defeat the 7 bosses standing in your way. Like Pouing, it’s an exclusivity for Windows Phone 7 and is now available on the Marketplace for $1.99USD. I hope you enjoy it! I’s been a while since our last release, but we have been hard at work to produce new games even tough we don’t have as much time to work as before. The first of those new games to come is Pouing, a mobile game that I like to describes as “Pong meets Mario Kart”. It plays like the traditional Pong except for bonuses that you can grab and that will give you new abilities like a time-slowing shield or extra balls. 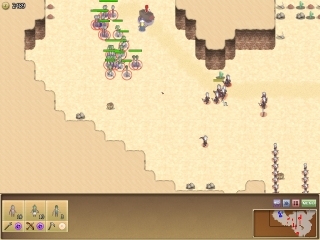 In addition of the single-player mode against the AI, a same-phone multi-player mode is available so that you can play against a friend of you. 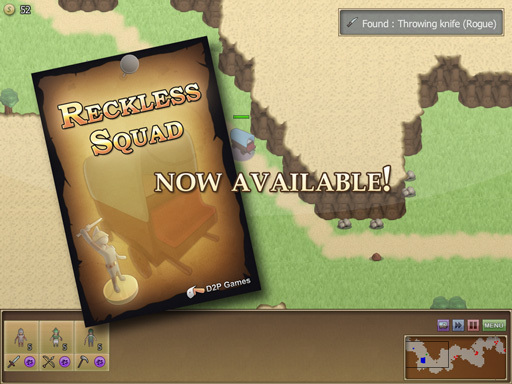 The first update to Reckless Squad is now freely available for those who buyed the game on GamersGate or our website! Intense and strategic battles, use your troops and their capacities wisely to defend your convoy or defeat the bosses after an epic fight. Every journey is unique: the game adapts itself to the way you play and the environments are created procedurally. You will never experience the same thing twice. Also features 4 levels of difficulty. Fight endless hordes of monsters in the Arena and see for how long your strategies can keep you alive. More than 40 achievements for you to unlock and 11 missions to complete. Twelve classes of units for you to chose from. Ranging from the good old Soldier and Archer to the more exotics Black Mage and Samurai. Every class of unit have its own distinct (and somewhat twisted) personality. 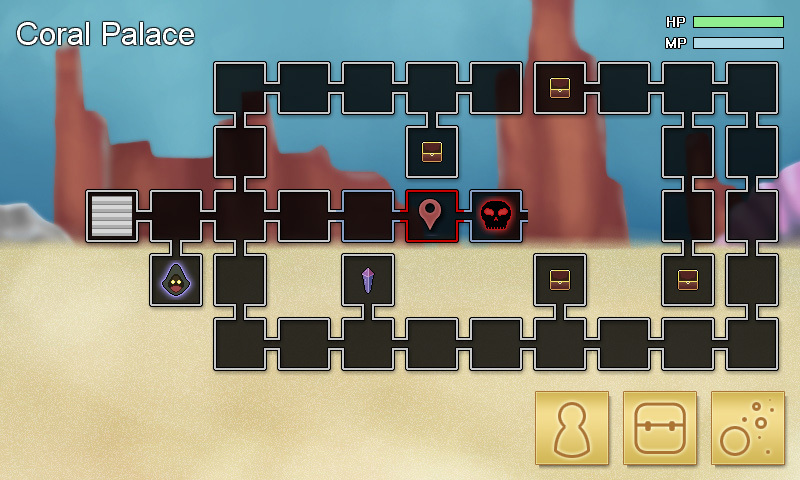 Most of them have secondary weapons with very different effects, allowing you to build complex strategies. Travel across a fantasy universe filled with elves, werewolves, pirates and ninjas… amongst others. Discover various environments, from the forest to the mountains, passing by the desert. And it’s always served with humor! However the free demo won’t be updated to reflect the 1.1 update, but they are mainly cosmetic changes, the gameplay is left untouched. One year and new design! As of today, December 15, D2P Games is one year old! We officially created the company exactly one year ago, and since then we have published our first title, Reckless Squad. With our new games being in development, this second year promises to be really interesting! In order to celebrate this birthday, we changed the design of the website, I think it’s better, more clear and spacious. Tell us what you think of it! I hope you will follow us this year as well to share those good moments with us! -50% off on GamersGate this week! Holidays are coming on GamersGate, and this week Reckless Squad is -50% off! You can buy it for only $3! It’s been 6 weeks since the release of Reckless Squad, and we’re happy to announce you the first update to Reckless Squad! Of course, this will be a free update for those who already purchased the game. For the others, it will be the version you get after purchasing from GamersGate or our website. There was a bug (sorry!) preventing the last mission (Tower Defense) from working properly. Fixed. Some small other bugs have been fixed. The main menu was totally redone. 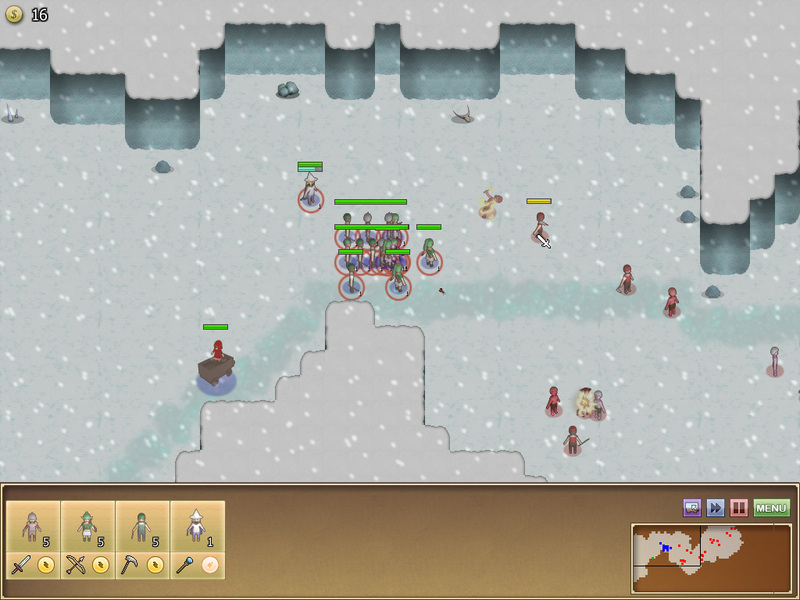 The environments’ graphics have been improved as well. Stay tuned, the release of this update is imminent! The art pipeline is something often underlooked by indie developers. 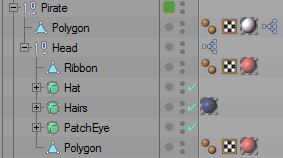 You may think that you don’t need one because you don’t have 3000 3D models with different textures, materials, etc. It may be true if you only have a small amount of images, sounds and music. But there are some cases when it’s very important to have a good pipeline, and Reckless Squad is one of those. They weren’t animated. I knew I needed 8 directions, at least 3 frames for walk animation, and a bunch of other animations like using a sword, a bow, or dying. The amount of work was just astounding, and I knew I couldn’t do it alone. Worst, I’m not even an artist to begin with. So I had to find a solution and use my abilities as a programmer to produce the needed content. Quickly it was clear that 3D was the way to go. However, we didn’t want the game to be in 3D. It was a huge amount of work as it is in 2D, no need to add more complexity. So we used pre-rendered 3D graphics, like Diablo or Age of Empires. To do it I started by modeling a base mesh with rough edges. Then I added Hyper NURBS to subdivide the mesh and make it look more organic. 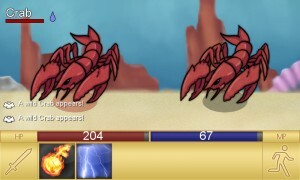 I wanted to keep the look and feel of the 2D sprites, and I knew the final images wouldn’t be larger than 48×48 pixels. So I used really simple shapes, with few to no details and plain colors as textures. Speaking of textures, I used palettes. If you played a NES or SNES RPG before, you may remember all the similar monsters with just different colors. It was because the developers used the same image with a different palette (to save memory). I used the same technique for Reckless Squad: I unwrapped the UV once, and then only changed the colors in the palette to make them match the unit. 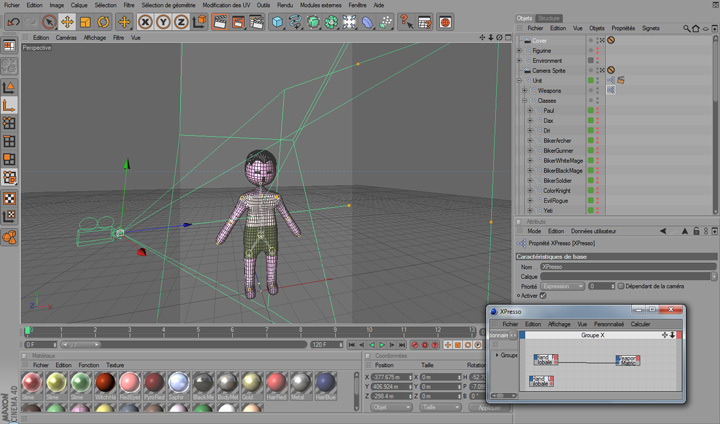 The next step was rigging, no magic here: I just added bones and painted vertex weights. What’s interesting is how I used little scripts to attach props to the bones, because different colors would never be enough to differentiate the units. 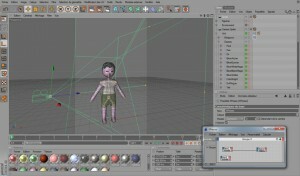 When the system to customize the base mesh was ready, it was time to add animations to it. It’s 14 frames, for just one direction, meaning 112 for an entire sprite sheet. I made the timeline 112 frames long, and started making poses using the previously created rig. Once I finished a direction, I copy/pasted it 7 times and rotated the model to face new directions. I configured the rendering so that it will save each frame to two bitmap files: one for the diffuse color and one for the alpha mask. It was the more automatic setup I could come up with. So I basically had 224 bitmap files on my hard disk, and I needed to combine them into a sprite sheet usable by the game. And I needed to make it automatic as well. So I wrote a little script in C# for that. The program create a blank texture sheet and then load the diffuse color and the alpha mask files for each frame and combine them before placing them on the sheet. When finished, it saves the final sheet to a new PNG file, with transparency. I’m glad I took the time to setup a real art pipeline as automated as possible, because I ended up with 46 sprite sheets. 5 152 frames in total. It would really have been impossible for me to do them by hand in a pixel art fashion. However, we did have some concerns with the graphics, mainly all the units share the same silhouette. Using very different and instantly recognizable silhouettes make the game easier to play and visually nicer. Just look at Team Fortress 2 and the amazing work done by Valve to give each class a unique silhouette. But I still know it would have been impossible to make them all by hand. Using morphing could be a solution, and it would be interesting to make some researches in this direction next time. 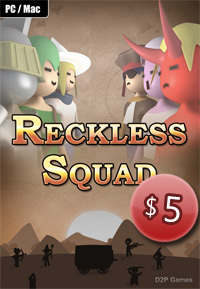 Reckless Squad for only $5! We have some big news for you! Reckless Squad can now be purchased directly from our website for only $5 USD! It’s half price, and it’s possible thanks to the well known and secure BMT Micro services. And of course buying the game grants you both Windows and Mac OS X versions. If you want, you can still check the free demo before buying the game. 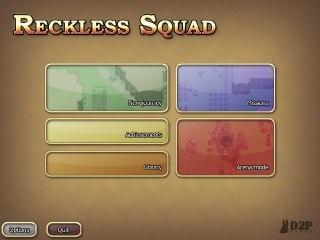 Reckless Squad has been released! 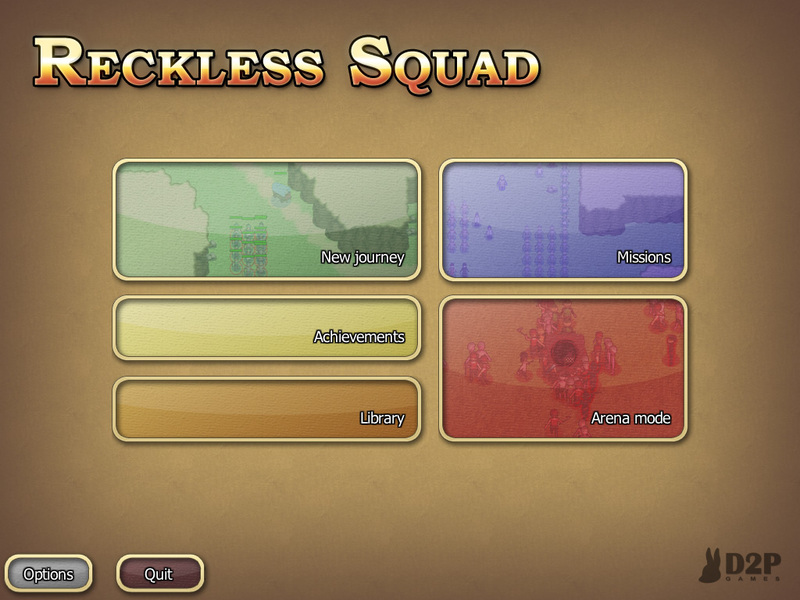 Big big news: Reckless Squad has been released! It was our first game and it’s now on sale, it’s the consecration of ten months of work, we’ve learned a lot of things on the way and we don’t plan to stop now! 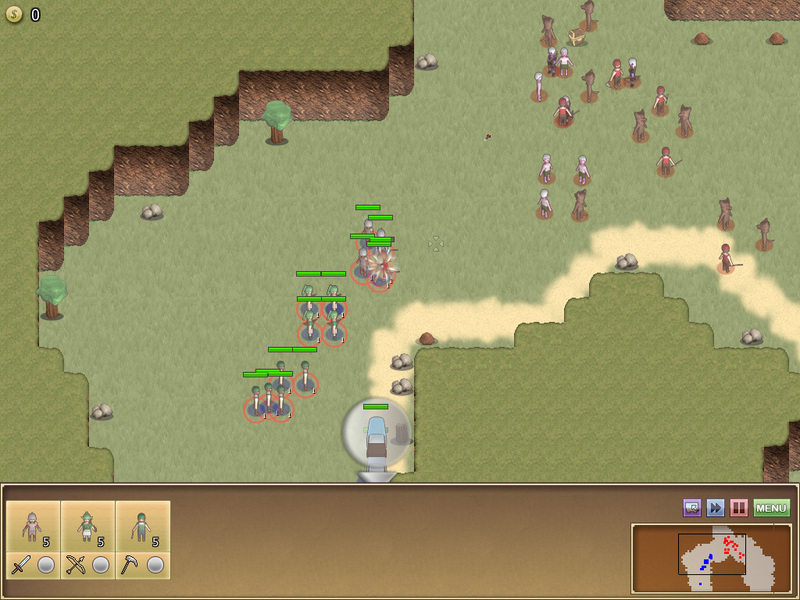 To talk about Reckless Squad itself, it’s a real-time strategy game where you have to protect a convoy. 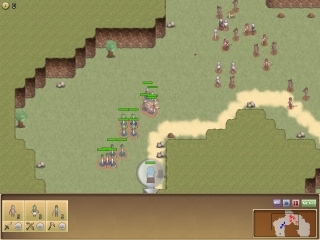 You have the choice between 12 classes of units to build your army and establish a strategy. We put a lot of focus on replayability: all the environments are procedurally generated and all the situations are adapted to the player’s skills. On top of that the game has 4 levels of difficulty, 11 missions, 40 achievements and an arena mode. You can find more informations, a trailer and a demo on the game’s page. The game is officially available for Windows and Mac OS X, in English and French for $9.99 on GamersGate! EDIT: The game is now for $6 USD on GamersGate and $5 on the game’s page! Reckless Squad available for pre-order! 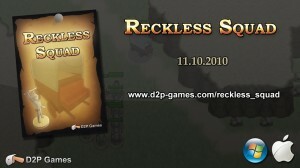 We’re proud to announce that Reckless Squad is now available for pre-order on GamersGate.com! The game is available for PC Windows and Mac OS X for a modest price of $9.95 USD. Finally, it will be released on October 11th, 2010. If you want to try the game, we have a demo version here. See the product page for more information!